At pattern settings you can set the number of patterns in the current project. Click "Set value" to define how much patterns will contain project. It can be from 4 to 16 patterns. By default new project contain 8 patterns. Don't set the number of patterns more than you need, it's not comfortable for work. Hint: Song of the project can contain not only patterns of current project but also can include patterns from other projects. Please note: If you reduce number of patterns all data of hidden patterns will be deleted. At song settings you can set the number of pages in current song. Click "Set value" to define number of song pages. It can be from 16 to 62. By default project contains 16 pages. One song page contain 16 measures. On 62 pages of your song can contains up to 992 measures. At 120 BPM song will be about 33 minutes long (by default on 16 pages it will be about 8.30 minutes long). These checkboxes define at what time MIDI presets will be sent to external output. By default MIDI presets are sent at the start of playback or recording pattern or song. But you can choose where the presets will be sent each time you select a pattern or song. For that set "At select song/pattern" checkbox. 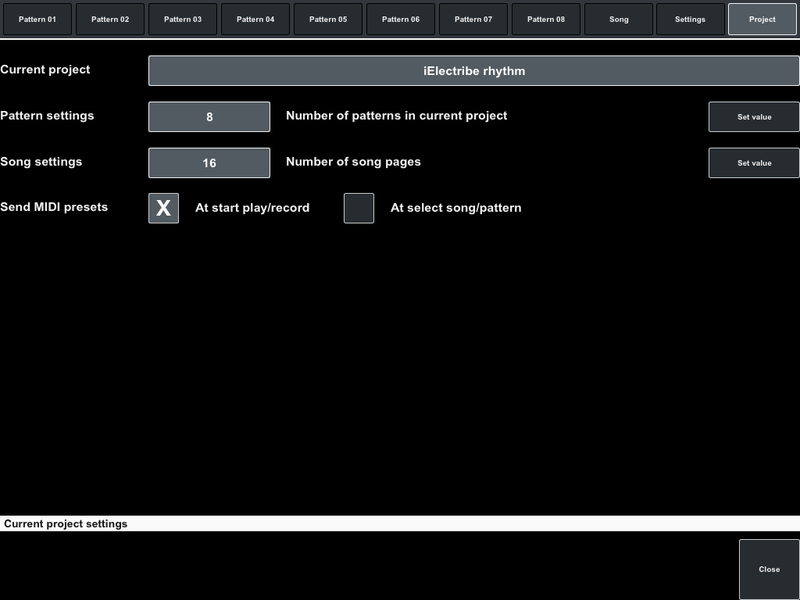 Please note: When you choose "At select song/pattern" checkbox, "At start play/record" checkbox always will set. If you don't want to automatically send presets, turn off these checkboxes. In this case, you can always send the presets by clicking on hotkey "Send presets" in pattern or song mode.